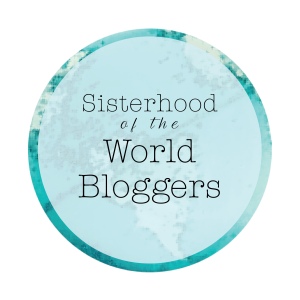 I am very pleased to have been nominated for the Sisterhood of the World Bloggers Award by Spellbound Book Reviews and would like to thank you very much! I’ve always been into blogging. I don’t remember when my very first blog was, but it was certainly over two years ago. Maybe even longer honestly. The reason why I started this blog: I have always loved reading and thought it would be fun to do reviews. 2. What is the hardest thing about running a blog? There are a couple things that are just as hard. Remembering to post at least once a day. Finding enough variety of content that my readers don’t get bored. Not getting discouraged because a post I worked hard on didn’t get any likes, or even views. These are the things that make it hard for me. 3. Which is the last book that made you laugh out loud? The Queen of the Tearling. But not because of the content. The author is from San Francisco and I am from Sacramento. A town in the book it Petaluma, which is a real town here in California and that made me laugh. 4. Which is the last book that made you cry? I can’t remember. Are we talking tear up or full on cry? Because tear up was Invasion of the Tearling, but full on cry is Deathly Hallows. 5. If you could actually meet a fictional character, who would you choose? -heavy sigh- These questions always throw me through a loop. My mind always just goes to the book that I am reading right now, but honestly as much as I love Kelsea Glynn, I don’t think I’d want to meet her right now. She’s a bit crazy… I also don’t want to say a Harry Potter character, because that’s obvious. But nothing else holds a special place in my heart. I think I will just go with Cinder from Cinder. I think I would like her. 6. What fictional character do you think you could be best friends with? Oh goodness. Another question like this? I always feel anxious answering these because what if my answer is stupid. I think I would be friends with a fellow bookworm. And there are quite a few of those. The closest to my age that I can think of is Kelsea Glynn, but unless she gets her act together I can’t see us being friends. 7. Who is your favorite hero or heroine? I am going with Tris Prior. She is the only character to actually die for what she is fighting for. 8. Which was your favorite children’s book? I read Socks by Beverly Clearly at least 50 times. My copy was so worn out. I have no idea where it went. I think my mom has it. 9. Which is your go to genre? I love Young Adult or New Adult. 10. If you were only allowed to read all books by one author, who would that be? I al falling in love with Erika Johansen. She is an amazing writer so I am going to pick her. 1. How many books are on your shelf that you have not read yet? 3. When you aren’t reading, what else do you like to do? 4. What are you currently reading and how is it so far? 5. eReader or physical book? Why? 6. If you could travel to any country in the world, what would it be and why? 8. If you could meet an author, which one would you want to meet? 9. What book, stand-alone or series, has your heart right now and why? 10. What is one food that you cannot live without? This entry was posted in Book, Book Tag and tagged award, blog, blog award, book, book tag, books, sisterhood of the world bloggers award, tag. Bookmark the permalink.